Textcase USA is now up and running in the city of Boston. Laura Pepitone manages the Boston office but she’s also still working on projects for European customers. If you are a translator, you’ll continue to hear from her on a regular basis – most likely in the middle of the night because of the time difference. In Utrecht, project manager Rachel Vermeulen is coordinating the other half of our projects and our team is supported by interns. We are expecting to hire a junior project manager this summer. In the early 1970s, Textcase started in Groningen, in the north part of The Netherlands. Language students at the University of Groningen became the foundation of the Textcase freelance network. 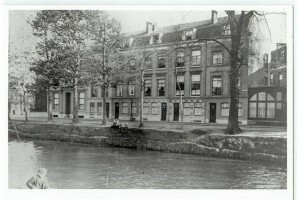 De Begijnekade in Utrecht in 1905. When Koert van der Scheer became the owner of Textcase in 2003, he moved the company first to the media capital of The Netherlands: Hilversum. In 2008, Textcase moved to its current location at the lovely Begijnekade in Utrecht, in the historic city center. In Boston, Laura Pepitone joined a co-working community where hundreds of small companies and freelancers work in the same space. It’s a great environment for Textcase to get started on the American market. Our office is on Atlantic Avenue in Boston, in the financial district. See a photo gallery of our new office here. In the US, we have already acquired several customers, including a company that captions hundreds of hours of videos weekly in many different languages. Therefore, we are looking for people who are interested in captioning videos (for instance English language videos that need English captions) in a user-friendly online environment on a regular basis. Contact Laura Pepitone via laura@textcase.com if you are interested. To connect with Textcase Boston, add us on Skype: textcase-boston. Textcase Boston also has its very own Google+ page. Lastly, don’t forget to tell us what you think of our brand new www.textcase.com website. Do bilingual people have a different perspective on the world?